What is less well known about Lepsius, the “German exception,” is that he established the German-Armenian Society, an organization which has just celebrated its 100th jubilee. Together with journalist Paul Rohrbach and the Armenian writer Avetik Issahakyan, Lepsius founded the “Deutsch-Armenische Gesellschaft” (DAG) in June 1914, whose aim was to promote understanding between Germans and Armenians as well as to cater to the needs of Armenians living in Germany. In addition, the DAG intervened to protect the interests of Armenian minorities in Turkey and other countries of the region. On June 14 of this year, the DAG and the Lepsiushaus (the research and meeting center located in Lepsius’s family estate in Potsdam) together celebrated the centenary with a conference and commemorative ceremony — at a time when events recollecting the outbreak of the catastrophic World War I are being organized internationally. In addition to Dr. Rolf Hosfeld, director of the Lepsiushaus, and Dr. Raffi Kantian, president of the DAG and publisher of its quarterly journal, the Armenisch-Deutsche-Korrespondenz, were political, intellectual and religious figures in attendance. Hosfeld said in his remarks, “The Frankfurter Allgemeine Zeitung referred to Johannes Lepsius recently as a representative of the politics of law in a period in which international relations were characterized by anything but principles of law. Implementing such principles of law in the Armenian question served the lobbying of the German-Armenian Society in its foundation before World War I, and these principles characterize its successors‘ work still today…. Following opening remarks by Hosfeld and Kantian was Prof. Manfred Aschke, president of the Constitutional Court in Thuringia, as well as member of the Lepsiushaus board. Aschke, who is the grandson of Johannes Lepsius, spoke about the period between the Armenian reforms of 1913 and the genocide, and the corresponding changes in the tasks of the DAG. Prof. Hacik Gazer, an Armenian from Istanbul, who is professor of Oriental Church History at Erlangen, illustrated German-Armenian cultural cooperation during the 19th century, taking the example of Armenian students. How Germany has dealt with the Genocide became a focus of discussion in a lecture given by Dr. Christoph Bergner. 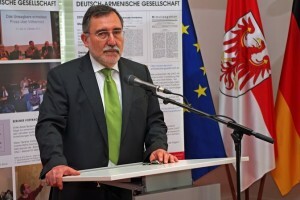 A member of the German parliament (Bundestag), Bergner talked about the resolution on the massacre and expulsion of the Armenians which that body voted up in 2005. The resolution urged the government to support efforts in Germany towards reconciliation, but, as he pointed out, the problems addressed in the initiative had still not been resolved. Prof. Armenuhi Drost-Abarjan, the leading Armenologist in Germany, presented the cultural-political collaboration between the federal state of Saxon-Anhalt and the Republic of Armenia. A round table discussion brought together several political figures, including Bundestag members. Under Kantian’s moderation, the participants assessed the current situation of relations among Armenia, Germany and Europe, with a view to the future. The festive celebration in the evening opened with music by tenor Artak Kirakosyan and baritone Asatur Baljyan. An ecumenical prayer for the founders of the DAG and those they protected was offered by Archbishop Karekin Bekdjian, Bishop Markus Dröge and Ecumenical Episcopal Vicar Father Matthias Fenski. This was followed by greetings presented by Gunter Fritsch, President of the State Parliament of Brandenburg, Hasmik Poghosian, Cultural Minister of Armenia, Stephan Dorgerloh, Cultural Minister of Saxon-Anhalt, Martin Gorholt from the Brandenburg State government, and Jann Jakobs, Mayor of Potsdam, which is the capital of Brandenburg. After another musical interlude by the vocalists, Prof. Jan-Hendrik Olbertz, President of the Humboldt University, delivered the keynote address. A former cultural minister of Saxon-Anhalt, he spoke about the cultural cooperation between that federal state and Armenia. The evening celebration took place in the Brandenburg State Parliament, housed in a magnificent castle, which, torn down in the 1960s, was rebuilt and has just recently reopened. Attending the conference and reception were more than 250 guests.